NEW YORK – A stylus might seem, well, out of style in the tap-and-type world of smartphones. Yet it’s what sets Samsung’s Note phones apart from the competition. That’s significant as Apple prepares to launch what’s expected to be a super-premium phone this week, one that will match many of the features in the new Note 8 phone . Though not its pen. Still, the Note 8 isn’t going to be for everyone. Most people will be fine with Samsung’s S8 phones for a few hundred dollars less. The Note 8 is more for “power users” – those who use their phones a lot more than the average consumer. The Note 8 starts selling in the U.S. this week for $930 to $960, depending on the carrier. What’s top on people’s minds probably isn’t the pen, but the phone’s battery, given last year’s Note 7 recall following a string of spontaneous fires. Samsung has stepped up its safety tests this year. Time will tell how well they work. Samsung reduced battery capacity by 6 percent to make room for various safety measures. But there’s still plenty of juice. The phone still had two-thirds of its charge left after four hours of Netflix. Tasks such as email, Facebook and note-taking won’t be as draining. A screen-off memo feature lets you use the stylus to take notes without having to unlock the phone. You can jot down a quick reminder while walking, or cross items off your shopping list at the store. It feels like real writing, without any noticeable lag. And writing a quick thought doesn’t feel as rude as opening an app and typing while with friends. Past Note phones translated words you hovered over with the stylus. The Note 8 extends that to full sentences, though it’s on you to figure out that you have to tap the “T” icon to switch modes. And you need to specify the language you’re translating from, even though the Google Translate service the feature’s based on usually has auto-detection. The translation feature also converts currency and units of measurements. That’s useful in figuring out that a 23-kilogram baggage limit means 50.71 pounds. But it repeatedly failed to pick up measurements in centimeters. And it didn’t pick up on a common European convention of using a comma where the decimal point usually goes, so 4.20 euros became 420 euros, or about $500. The dollar is getting weaker, but it’s not that bad. You can now handwrite text messages, instead of just typing them. Messages are sent as animated GIF files, so your friends can see your exact strokes, even if they don’t have a Note 8. Those who already pepper messages with emojis and other embellishments might like it. Beyond the stylus, the Note 8 mostly matches features introduced in Samsung’s S8 phones this past spring. 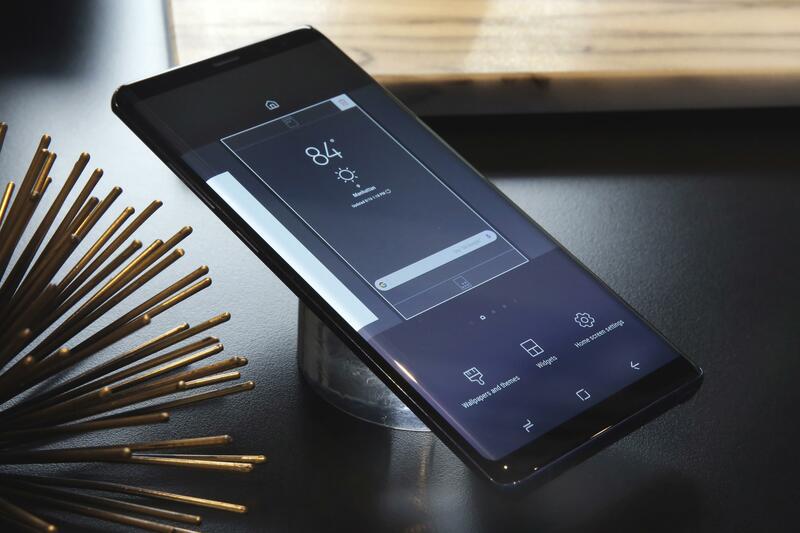 This includes an “infinity display,” in which the 6.3-inch screen runs up to the edge, giving the phone more display without feeling much bigger. The fingerprint sensor is on the back, as with the S8, though it’s now farther from the camera lenses to reduce smudge. And yes, that’s lenses. The Note 8 has a second lens on the back, with twice the magnification, matching Apple’s iPhone 7 Plus. This permits software tricks that blur out the background , though conditions have to be just right. I find the second lens more useful for zoom. Apple is expected to announce new iPhones today, including an anniversary edition that, according to published reports, will include a similar edge-less display, as well as a color-boosting screen technology called OLED, something Samsung has long used. Apple users will probably want to stick with that and avoid having to buy new apps for Android. Current Note users, though, may want the Note 8, as Apple isn’t likely to include a stylus. And because of the Note 7 recall, the current Note models are getting old.